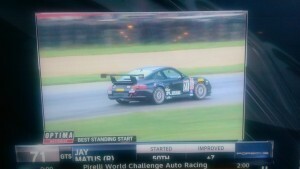 Sunday, August 10th, 2014 NBC Sports aired the Toranto and Mid-Ohio Pirelli World Challenge races. Jay’s Optima Battery Best Standing Start Award win was featured during the coverage. Check out this screen shot from the coverage. You can also check out a full Race Report of the Round 11 rain race on Autoweek by clicking here. J&S Matus Motorsports, Inc. possesses the reputation and experience of successful business development and marketing within the motor sports community. We intend to leverage our knowledge and abilities to increase your exposure in the market place and create more loyal customers. ©2019 Texas Speed | site by MYHRECO.